Funny thing, Bigfoot. I would imagine the existence of what appears to be just another species of ape should have been proved or disproved years ago. However, it hasn't. some conspiracy theorists believe that this is because the Bigfoot 'race' can actually transport themselves between dimensions. Never thought of that one. Who knows what bigfoots are really up to? Bear in mind that not all aspects of Bigfoots are known until one is caught. Maybe they are just big apes, or maybe they are an intelligent dimension hopping species with their own goals and desires. SKILLS: Strength 4, Awareness 4, Hunting 4, Fishing 3, and possibly some knowledge based ones? TALENTS: Survivor, Strongarm, and possible more? Dimensional blinking? 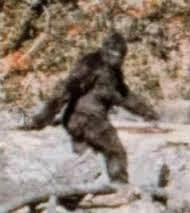 : Bigfoots can go from one dimension to another. This might just be a case of teleporting from one place to another or they might be able to travel through time or to different worlds. The cost of this depends on how far they travel and whether it is through just space, or time as well and also if they want to control it precisely. Teleporting a few metres costs 1 magic point. Teleporting to a specific year and place would cost up to 18 magic points.